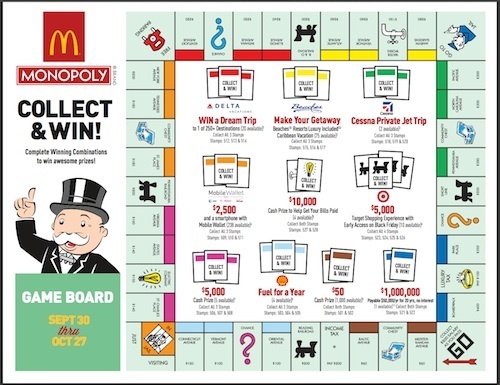 McDonald's goes to the McWell one more time tomorrow, kicking off another round of its Monopoly game promotion. Actually, a Pre-Promotion Sweepstakes lasts for one week beginning September 23, with the full Monopoly game set to launch on September 30. Menus are not the only thing that McDonald's is capable of over-complicating. For the Pre-Promotion Sweepstakes, consumers are urged to Like McDonald's on Facebook or follow it on Twitter because a special free Code will be given via those channels. Go from social media to PlayatMcD.com for a chance to win $10,000. With full-tilt Monopoly, consumers can win $1,000,000 (payable as $50,000 per year over 20 years) or one of several new prizes, including a Dream Trip through Delta Vacations, a Beaches Resorts vacation, a Cessna Private Jet Trip (destination to be determined) and $2,500 with a smartphone equipped with Mobile Wallet. The Free Parking game piece could be worth $100,000. There may never have been more pressure to succeed than this version of Monopoly carries. A year ago, U.S. same-store sales were up +0.7% thanks to Monopoly as well as the Mighty Wings launch. Since then the largest restaurant chain in the world has had difficulty posting positive quarterly reports for U.S. sales. For August, U.S. comp sales were -3.7%, the worst decline in more than a decade. McDonald's would gladly take a 0.7% gain for September and/or October. Last October, McDonald's Corp. President-CEO Don Thompson lauded Monopoly as a way to focus attention on core classic menu items such as the Big Mac or Chicken McNuggets. Further, it "drives traffic and builds average check while also engaging customers in a fun and familiar game experience that's only available at McDonald's," Thompson told analysts then. The company certainly is hoping that Monopoly can work that kind of business magic one more time. New Zealand's Commercial Approvals Bureau has said, "No, no, never, never" to Carl's Jr.'s suggestive TV commercial for its Texas BBQ Thickburger. The "I Love Texas" spot--with model Hannah Ferguson wearing a black-leather sorta swimsuit and sudsing up a grimy truck in a barn plus a special cameo by Paris Hilton--won't be seen on TV in New Zealand. Of course, every young Kiwi worth his Thickburger has already seen the spot on YouTube a few times and has been irrevocably corrupted. 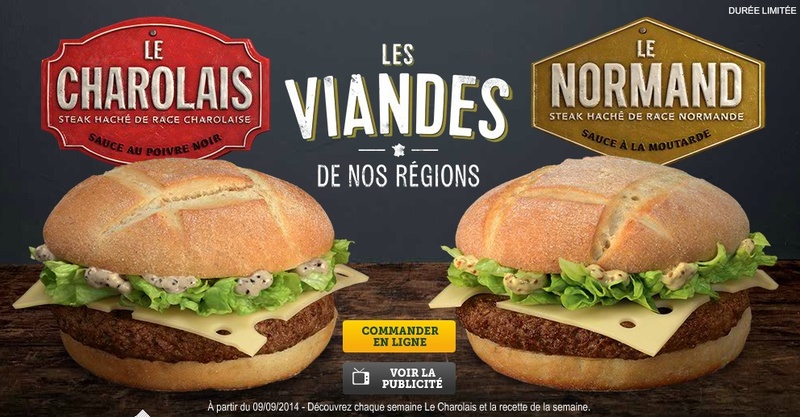 In February 2011, McDonald's gained credence in France for its commitment to local food sourcing when it launched a snack-size burger made with local Charolais beef. Now the chain is back with not one but two more French cattle breeds. As part of a "Les Viandes de Nos Regions" (Our Regional Meats) campaign, McDonald's has created a full-size Charolais burger and introduced another burger made with Normande beef from Normandy and a third with Montbéliard beef from the region of that name. The "Le Normand" burger has French Emmental cheese, lettuce and mustard sauce and is served on a new cross-hatched bun. The "Le Montbéliard" has an onion sauce instead. Speaking of buns, McDonald's continues to explore alternatives, at least overseas. In Denmark the chain introduced Big Ciabatta burgers (beef or chicken) on ciabatta rolls not seen here. These have bacon, Monterey Jack cheese, lettuce, tomato, red pepper, grilled onions and a peppery barbecue sauce. In Spain it introduced "Los Irresistibles": The double-patty Little Italy and Soho BBQ burgers on seeded buns. Marketing materials describe the latter burger as a "delicious combination of flavors from one of the most cosmopolitan and creative neighborhoods: Soho." McDonald's love for naming overseas menu items after New York City neighborhoods continues as well.